The main raw materials of the product are high quality petroleum coke and low grade needle coke.Sometimes the electrode body needs to be impregnated. The mechanical properties of the product are higher than those of regular power products, such as low resistivity, which permits the passage of a larger current density. 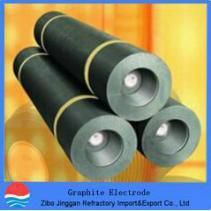 The graphite electrode products we supply are used in roughing furnace and refining furnaces. They have three quality grades: RP, HP and UHP. They are divided into various specifications according to their diameters and lengths. It is a good conductive and heat conductive high temperature product for steelmaking. The product we supply has a low consumption rate per ton of steel.in roughing furnace, the consumption rate of UHP product per ton steel is less than 1.8kg, and in refining furnace, the consumption rate of UHP product per ton steel is less than 0.5kg. The product is black and cylindrical. 1)The size of the product is bigger, the diameter is 300-600mm. 2)The product is used in high power electric furnace, and the consumption rate of ton steel is low.